Toronto based graffiti artist Kwest recently made his way out to the Belle Province to paint a massive new piece on the streets of Montreal. With no projectors or assistants, the piece took 30 cans and 10 gallons of bucket paint and was done in just 30 hours. We recently posted up some photos of our man Kwest creating a massive new installation for the Container Yard in downtown Los Angeles. Here we have a short new video filmed and edited by: J Strickland of the man at work. Peep the vid below! Toronto graffiti legend Kwest teamed up with Jordan to make an incredible installation for the Jumpman pop up store in Toronto. On display over this past All Star weekend, Kwest dissected a number of sneakers to create a new wall hanging sculpture that resembles a bird spreading its wings. 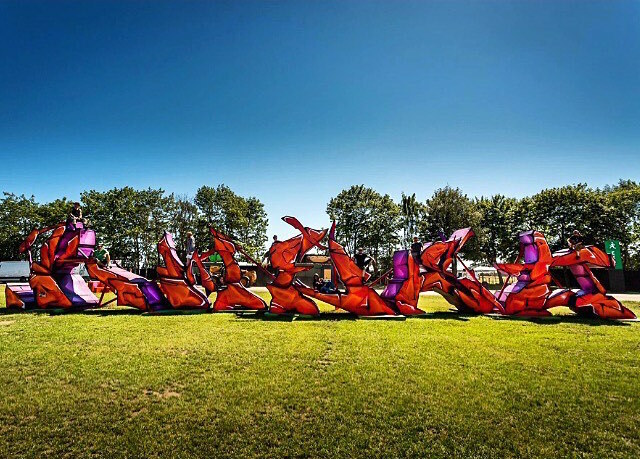 Canadian graffiti artist Kwest, visited Roskilde Festival 2015 to build the World’s biggest graffiti letter sculpture. Check out the process of creating this monumental piece and see the amazing result he produced for the festival-goers to enjoy during #RF15.